Become ready for the best tool download practice you have ever felt! Find the numerous software lists, check the recent releases of the popular tools, and shareware software for free. Open special admission to all kinds of notebook applications: enterprise tools and utilities, antiviruses, education software, and many others. The Softempire first class software program catalog becomes larger always! Each current week delivers special innovated software applications here, the greatest software utility downloads. Download for free and get a result! Utility software downloads freeware, shareware, and demo Download now! System software planned to help explore, configure, optimise, and maintain the computer. first-class Disk utility software downloads for Windows 7. Windows utility software tool collection to evaluate, structure, and optimise the works of the computer. idoo file encryption is the super best file encryption software, this powerful and useful file encrypt tool can help you quickly and safely lock and hide files, folder, and drives, and it can use 256-bit AES encryption to encrypt your files located on HDD drive or any portable media such as USB drives. Password Protected: idoo File Encryption program is a password-locked software, that is to say, there's no other way to run or unstall it if you have not the password. Hardware : Compatible Fully support IntelÂ® Pentium D Dual-Core Processor and AMD Athlonâ?¢ 64X2 Dual-CoreProcessor; System : Windows 2000/2003/XP/Vista/Windows 7 (32&64) . 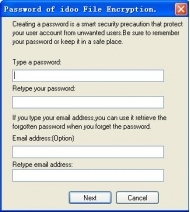 As the most poweful file data encryption tool, this application can encrypt most formats of windows files , for example, Microsoft Office documents (MS Word .doc and .docx file, MS Excel .xls file, MS Powerpoint .ppt files, MS outlook pst email files, BMP images, JPG/JPEG photos, GIF picture files, TIFF photo files, PNG picture files, Lotus office notes & files, pdf files, mp4 videos, avi video files, 3gp files, mp3 music, RMVB movies, RM films, winrar zip files).